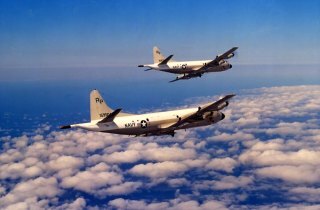 The P-3 Orion is a four jet turboprop aircraft made by Lockheed for the Navy, beginning in the early 1960s. 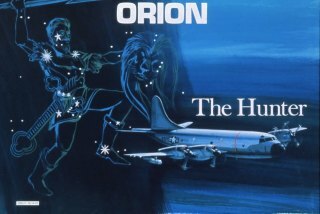 It is named Orion for the mythical hunter of the same name. 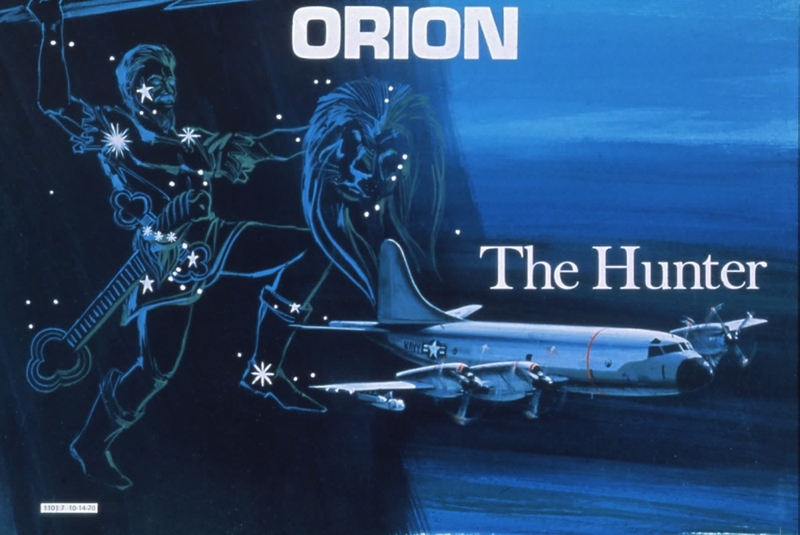 The Orion could remain aloft for up to 19 hours without refueling. We normally carried three pilots, who exchanged seats every four hours. 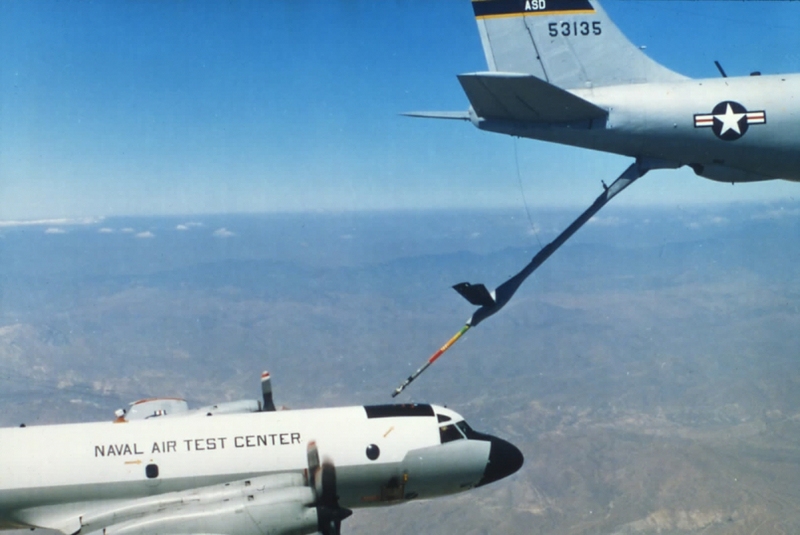 The P-3 Orion underwent near-continuous upgrades to keep pace with advancing sensor technology. When I came to the Black Lightnings (VP-31) they were flying TP-3As’, P-3Bs, P-3 Charlie baselines (shown here), Charlie Update Is, Updates II’s and Update III’s. 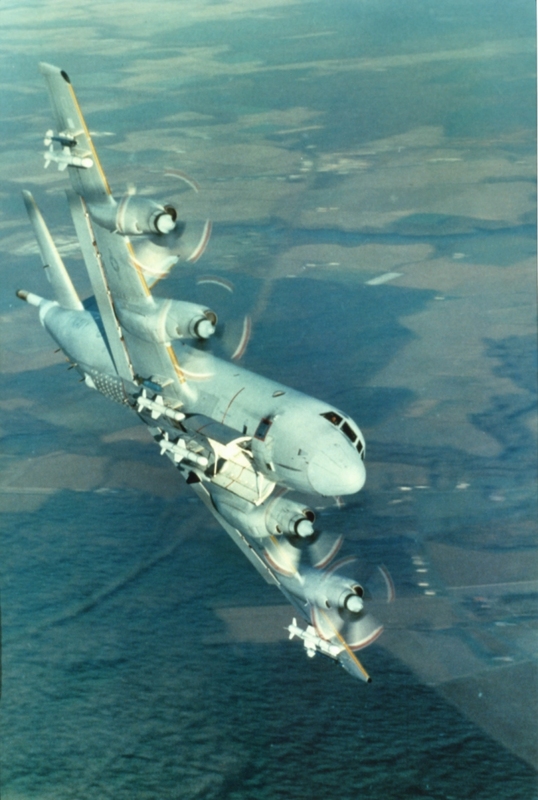 The P-3 Orion was a substantial offensive threat, capable of carrying 6 homing torpedoes in an internal bomb bay (shown open here), nuclear-tipped depth charges, or an array of missiles, such as the four Harpoon anti-ship missiles shown on this aircraft. 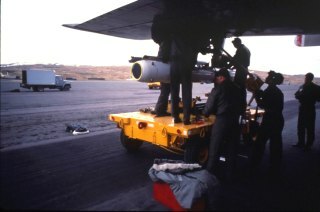 Crewmen loading an AGM-84D Harpoon on the outer ordnance shackles of a P-3 Orion. The Harpoon is all weather over-the-horizon air-to-surface antiship missile which carries 488 pounds of high explosives. 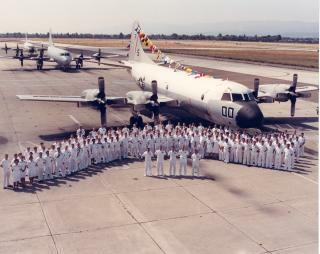 It has been carried by P-3s since 1979. 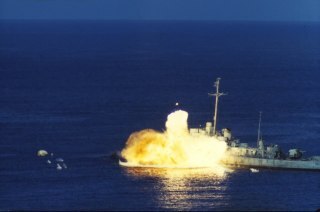 Harpoon missile hitting an retired destroyer at the Pacific Missile Test Range off Point Mugu. 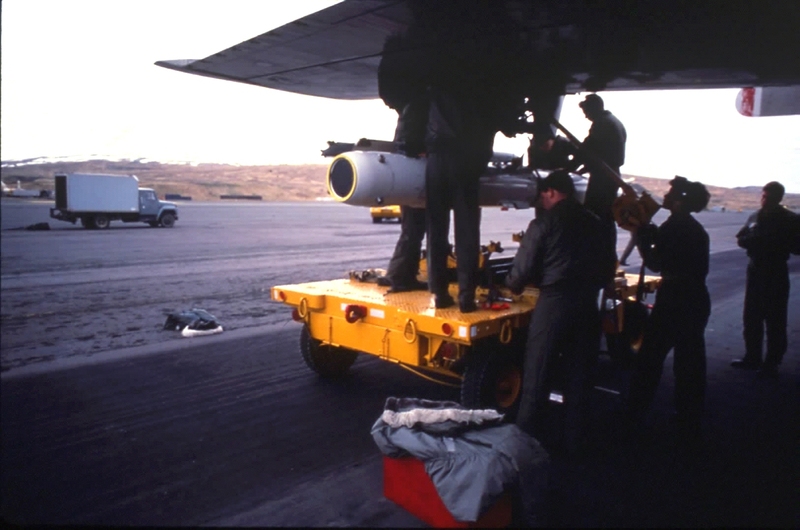 The Harpoon penetrates the interior of the target before detonation, creating enormous damage. 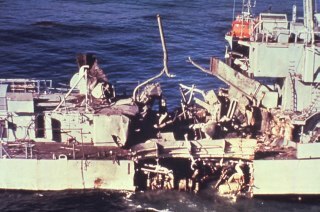 This shows the damage a single Harpoon did to a destroyer during a test firing. My poignant memory of Harpoon live firing exercises was the time we zapped an Indian freighter near the Hawaiian Islands who had negligently disregarded all of our NOTAMs - Ouch! That'll teach ya to read your message traffic! Cockpit of a P-3C, which was considerably modernized compared to older variants (we called the P-3B the "Bravosaurus"). The C model used the APS-115 surface search radar, which was a remarkable asset, capable of detecting all kinds of little things sticking out of the water. 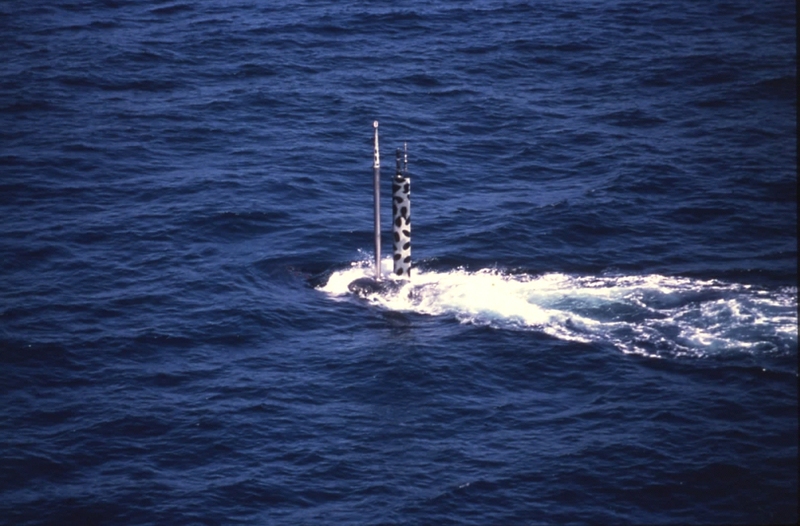 Submarines carry all kinds of extendable devices in their sail which allow them to sense above the ocean's surface. This is a close-up view of a periscope (on left) and other electronic surveillance and communications probes. 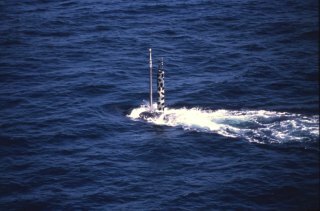 We could easily detect periscopes with our APS-115 radar, but we had much better results tracking subs passively, from over-the-horizon. 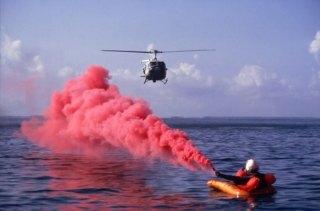 All aircrew must undergo a rigorous water survival training syllabus, with a renewal course every three years. 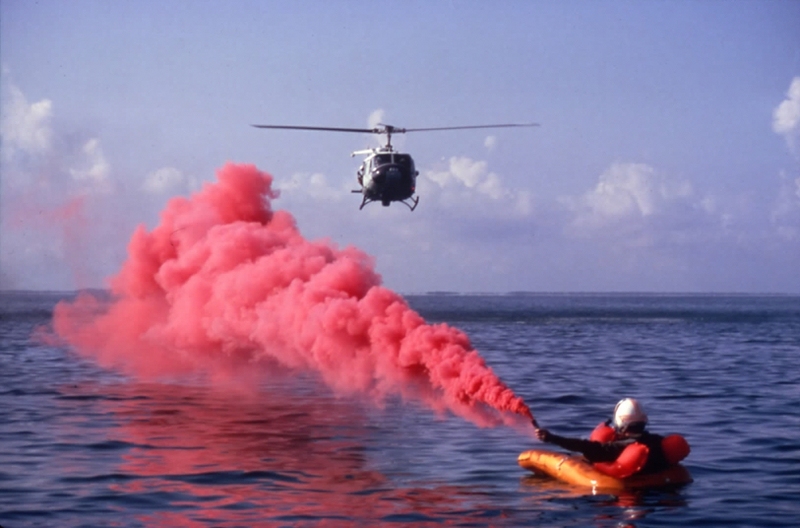 This shows a student deploying a Mk 13 smoke flare to aid the helicopter in finding him. The calm waters of Pensacola Bay (pictured here) are stark contrast to the open ocean, which is never this calm. 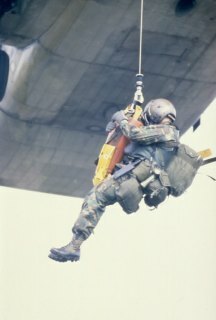 Here’s a successful “pick” of an air crewman by a Navy CH-46 chopper. We routinely carried 37 pounds of flight gear, including our boots. Having grown up swimming everyday of my childhood helped immensely. 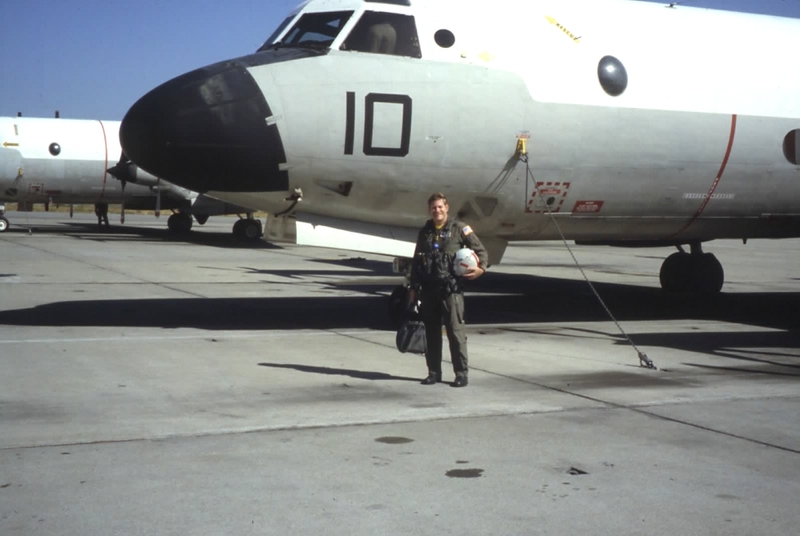 That's me standing in front of Romeo Papa ONE ZERO of VP-31 on October 3, 1990, after completing my last NATOPS check flight qualifying for my NAO wings. 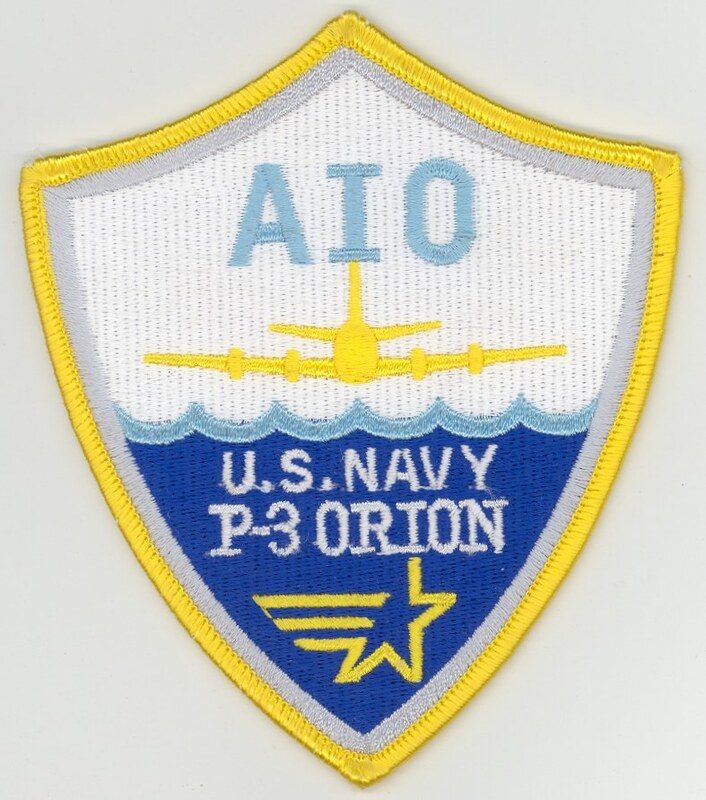 I was the first Air Intelligence Officer in Patrol Wings Pacific Fleet to become aircrew qualified in the P-3 Orion. 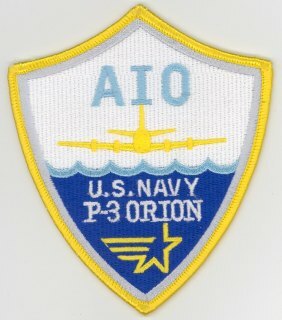 Lockheed sent me five specially configured “AIO” shoulder patches for my flight suits. I thought that was pretty neat! The most coveted role in the maritime patrol aviation community was to be a CNAP-NATOPS (Commander Naval Air Forces Pacific - Naval Air Training and Operating Procedures Standard) evaluator. 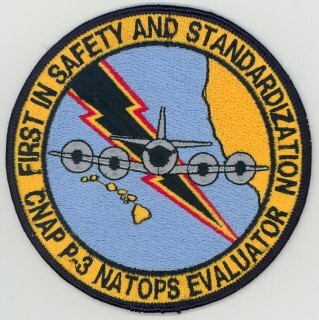 Like TTT, these fellows were selected from VP-31 and were regarded as the ultimate experts in the operation of P-3's. 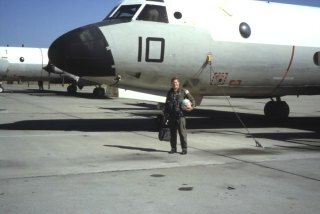 They were treated like VIPs by whatever squadrons they visited, so I always liked traveling with them. Some of the research which we were associated included air-to-air refueling tests of P-3 Orions, such as that shown here out of Point Mugu from an Air Force KC-135. Each year we got an opportunity to exchange places temporarily with crews of Navy LC-130s, Air Force and Coast Guard crews flying different versions of the C-130, because the Hercules aircraft used the same Allison T-56 turboprop engines as our P-3s. 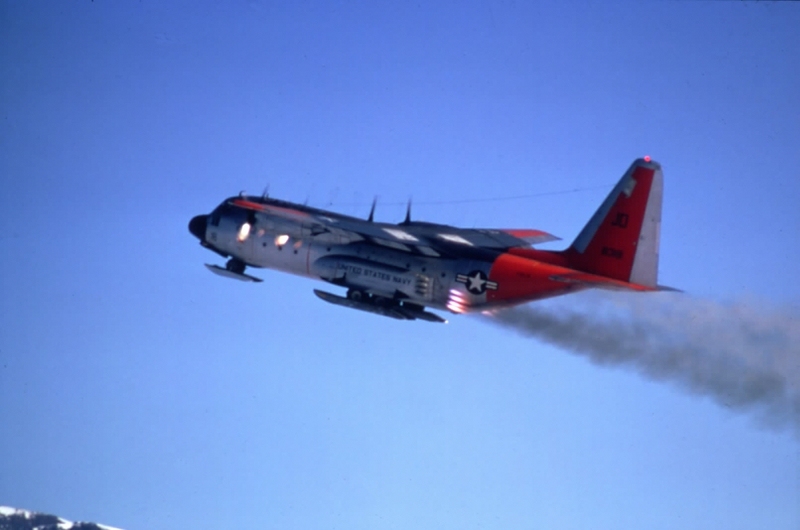 This view shows an LC-130 one taking off from Antarctica using Jet Assisted Takeoff (JATO) packs. 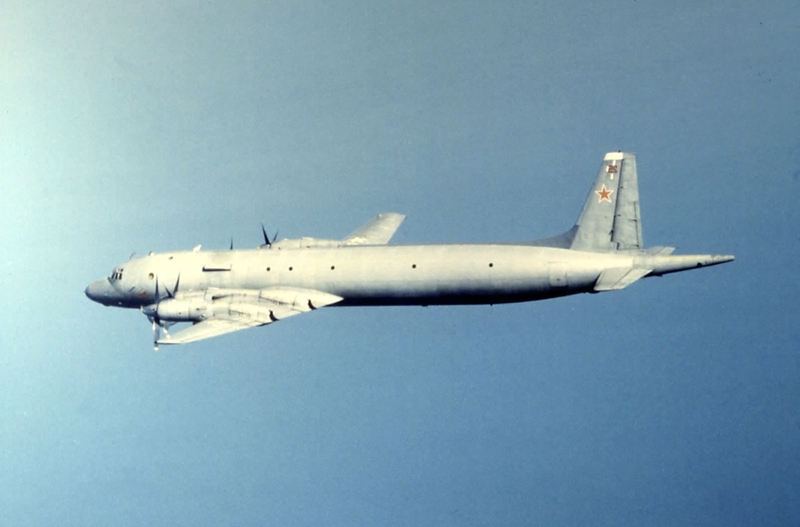 In-flight view of a Soviet IL-38 May maritime patrol aircraft, the Russian equivalent of our P-3 Orion. 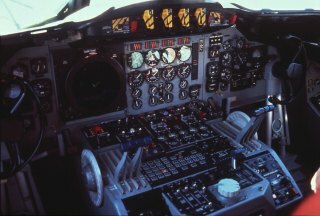 The Patron Master Augment Unit at NAS Moffett Field, just before we were disestablished in late 1991. VP-MAU was a novel concept in the reserve force, augmenting active duty units wherever they needed help. 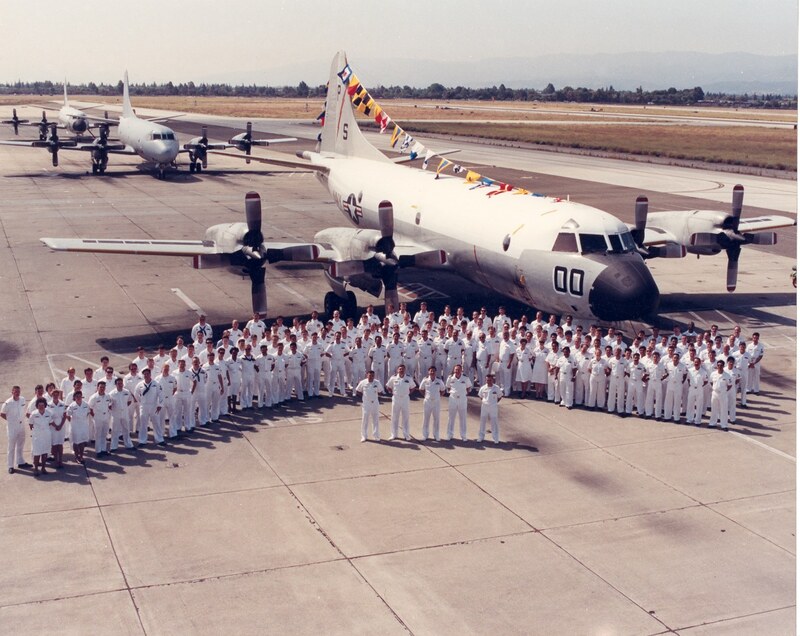 I was proud to be a part of this elite unit who was working at the cutting edge of Navy VP operations, not just collecting pay to take correspondence courses.